BACKGROUND AND PURPOSE: Pseudomeningocele is a well-known MR imaging finding in Erb palsy. Our aim was to evaluate the prevalence and imaging features of PST, a lesser known but, in our experience, more common finding in Erb palsy. MATERIALS AND METHODS: This retrospective study consisted of 37 subjects with Erb palsy from birth trauma. MR imaging examinations of the brachial plexus were evaluated independently by 2 neuroradiologists for the presence and signal-intensity characteristics/configuration of PST. Other findings included pseudomeningocele and posterior humeral head subluxation. The Blyth-Still-Casella procedure was used to construct an exact 95% CI for the percentage of patients seen to be positive for a specific imaging or anatomic feature by at least 1 observer and for the percentage positive according to both readers. RESULTS: The percentage of subjects found to have PST by both readers was 95% (35/37) (95% CI, 86.2%–99.9%). The PST was typically isointense to muscle on T1- and hyperintense on T2-weighted images. The most common morphology of the PST was a round or oval mass, though other morphologies were observed. Pseudomeningocele and posterior humeral head subluxation were reported in 40% (15/37) and 81% (30/37) of subjects, respectively. CONCLUSIONS: PST was the most common MR imaging finding in our series of subjects with Erb palsy and was observed more frequently than currently used imaging features. Although the morphology of PST is somewhat variable, several distinct patterns were observed, possibly reflecting different histologic compositions. 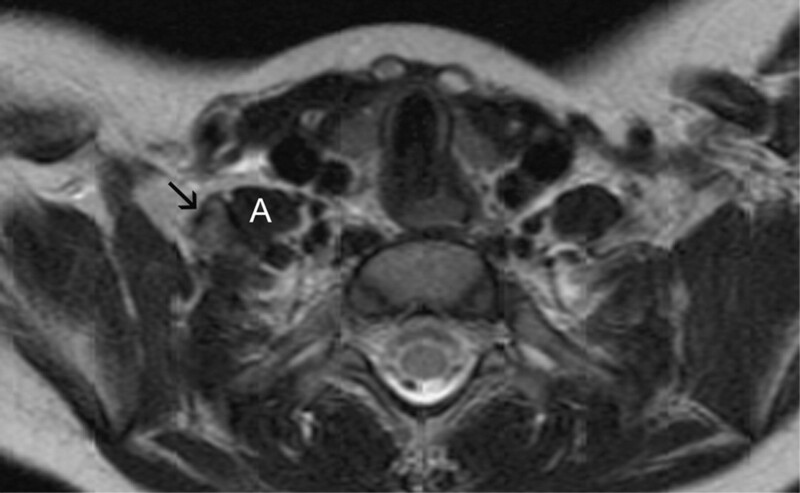 In our experience with imaging Erb palsy, we have frequently appreciated signal-intensity abnormality around the anterior scalene muscle, termed PST. While a few reports of this finding exist in the literature, little is known about its sensitivity or spectrum of appearances.2,5,6 This article presents a retrospective review of our series of patients with Erb palsy, describing the prevalence and imaging features of PST compared with other more classically recognized findings. This retrospective study followed approval by our institutional review board with a waiver for informed consent and consisted of a sequential series of 37 subjects clinically diagnosed with Erb palsy from birth trauma who underwent MR imaging at 2 institutions between April 1997 through July 2006. The mean age of subjects was 8.46 months (range, 3–28 months). Given that brachial plexus injury occurred at birth, this also represents the length of time between injury and imaging. MR images of the brachial plexus were performed on a 1.5T magnet and consisted of T1- and T2-weighted sequences in the axial, sagittal, and coronal planes, targeting both sides. Sagittal and axial T1 fast- spoiled gradient and T2 fast spin-echo sequences were performed. No contrast was administered. Each MR imaging examination was reviewed independently by 2 neuroradiologists, blinded to the side of the clinical abnormality. The presence of PST was assessed in a binary fashion. If observed, the side and size of the abnormality were recorded. In addition, the T1 and T2 signal intensity characteristics and the location of the PST were described; the location was categorized with respect to the anterior scalene muscle as anterior; anterolateral, wrapping around the margin of the anterior scalene muscle; lateral; or posterior, coursing in between the anterior and middle scalene muscles, along the expected course of the brachial plexus elements. Brachial plexus thickening, a distinct entity, was considered to be present when amorphous increased soft tissue was identified in between the anterior and middle scalene muscles without a focally discrete mass in this region; brachial plexus thickening could be present as an isolated finding or in association with PST in an anterior, anterolateral, or lateral location. Other findings noted included the presence of pseudomeningocele, posterior humeral head subluxation, and spinal cord signal-intensity abnormalities. A McNemar test was used to determine whether the 2 observers differed with respect to the percentage of positive calls for PST, pseudomeningocele, and posterior humeral head subluxation. The Blyth-Still-Casella procedure was used to construct an exact 95% CI for the percentage of patients positive for a specific imaging or anatomic feature by at least 1 of the 2 observers and for the percentage positive according to both readers. All reported P values are 2-sided exact significance levels and were statistically significant at <.05. PST was identified in 35/37 patients by 1 observer and in 36/37 by the second observer. The percentage of subjects observed to be positive by at least 1 observer was 97.3% (95% CI, 86.2%–99.9%), and the percentage of subjects observed to be positive for both observers was 94.6% (95% CI, 82.0%–99.0%) (Table). The PST was found to be T1 isointense to muscle in 33/35 (94.3%) and 35/36 (97.2%) subjects for each of the observers, respectively (Fig 1 A). The remaining subjects demonstrated mildly hyperintense T1 signal intensity (Fig 2 A). On T2-weighted images, PST was noted to be hyperintense to muscle in 34/35 (94.4%) and 35/36 (97.2%) subjects (Fig 3), with the remaining subject demonstrating isointense T2 signal intensity. In most cases, the PST was identified either anterior or lateral to the scalene musculature (Fig 3). This pattern was present in 23/35 (65.7%) for 1 observer and 23/36 (63.9%) for the second observer. Posterior (Fig 1B) and anterolateral (Fig 2B) locations were less common, occurring in the remainder of the cases. A, T1-weighted image demonstrates isointense PST (arrow). B, T2-weighted image demonstrates focal PST (arrow) positioned posterior to A, coursing through a fat plane between A and M.
A, T1-weighted image demonstrates mildly hyperintense PST (arrow). B, T2-weighted image demonstrates moderately hyperintense PST located anterolateral to A, wrapping around its margin. T2-weighted image demonstrates T2 hyperintense PST (arrow). This is located lateral to A. The mean size ± SD of the focal PST was 8.90 ± 3.01 mm for observer 1 and 11.00 ± 3.88 mm for observer 2. Generalized thickening of the brachial plexus (Fig 4) was observed in 7/35 subjects (20.0%) and 5/36 (13.9%) by each of the observers. For observer 1, brachial plexus thickening was seen in association with discrete PST in 5 subjects; only 2 subjects (5.7%) demonstrated brachial plexus thickening as an isolated finding. For the second observer, all 5 subjects with brachial plexus thickening also had a discrete PST. T1-weighted image demonstrates both focal PST (arrow) and thickening of the brachial plexus (arrowheads) as it courses in between A and M.
Posterior humeral head subluxation, best seen on T1-weighted images (Fig 5), was the second most common finding observed in our series, identified in 32/37 of subjects by 1 observer and 30/37 of subjects by the other observer. The percentage of subjects observed to be positive for at least 1 observer was 86.5% (95% CI, 72.7%–94.5%) and the percentage of subjects observed to be positive for both observers was 81.1% (95% CI, 65.6%–91.7%) (Table). T1-weighted image demonstrates posterior subluxation of the right humeral head (asterisk). 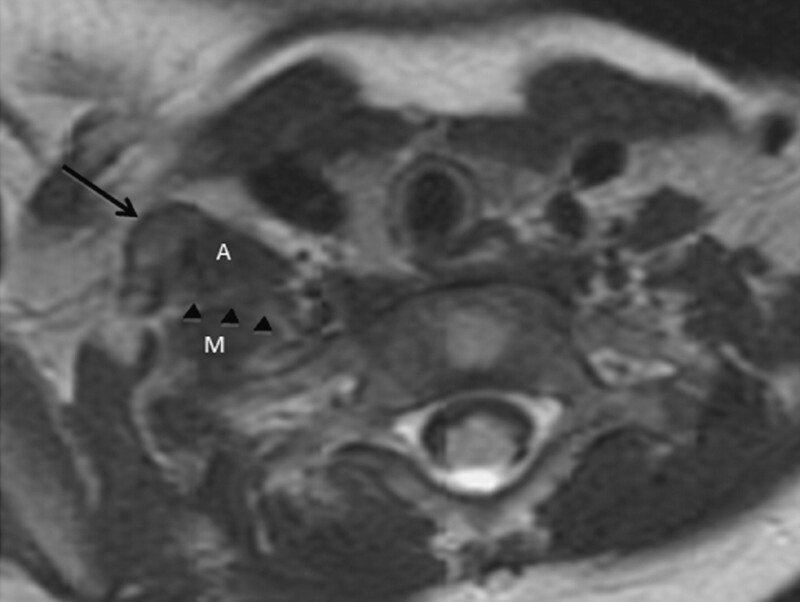 Pseudomeningocele appeared as a CSF-intensity round or oval structure adjacent to the nerve root (Fig 6). One observer identified a pseudomeningocele in 16/37 of patients, and the other observer identified it in 15/37 of patients. The percentage of subjects observed to be positive by at least 1 observer was 43.2% (95% CI, 27.3%–60.4%), and the percentage of subjects observed to be positive for both observers was 40.5% (95% CI, 24.8%–57.3%) (Table). 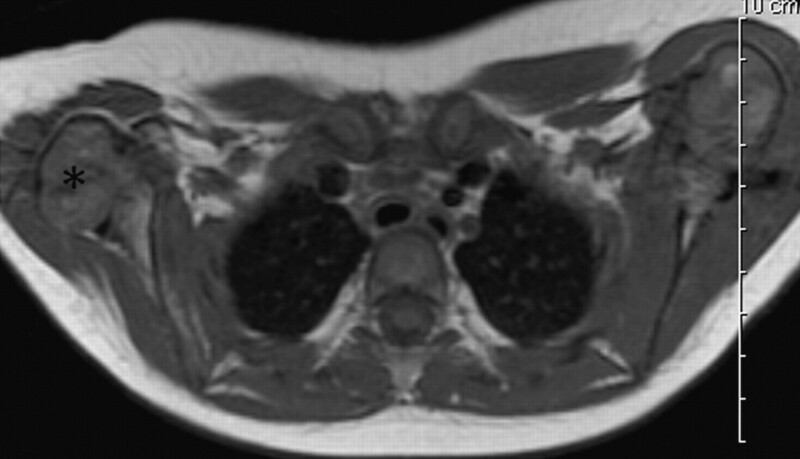 A, T1-weighted image demonstrates a pseudomeningocele (asterisk). B, T2-weighted image demonstrates a pseudomeningocele (asterisk) as a CSF signal-intensity focus to the left of the thecal sac, extending into the neural foramen (arrowhead). No signal-intensity cord abnormalities were identified in these subjects. In our experience, PST is the most common MR imaging finding in patients with Erb palsy. While several of the more classic MR imaging findings were also found in our series, they occurred with lower frequency than PST. Our data support the findings of Medina et al,2 who reported that PST demonstrated higher sensitivity and specificity for nerve root injury than pseudomeningocele. Pseudomeningocele was seen in less than half of our subjects. This finding has long been recognized with myelography, and its well-known association with Erb palsy to this day is likely a carryover from more conventional modalities and may be less reliable in the modern era of MR imaging. PST demonstrates consistent signal-intensity characteristics, typically best seen on T2-weighted images, owing to its slight hyperintensity. PST most commonly occurs as a focal mass with a variable relationship to the scalene muscles. We speculate that the different configurations of PST observed in this study may reflect variations in histologic composition. In particular, the focal forms, which parallel the nerve, may consist of a reparative neuroma, which is a known phenomenon in Erb palsy. In the study of Medina et al,2 posttraumatic neuroma occurred with a sensitivity of 97% and a specificity of 100%. Our series is unique in that PST was the only MR imaging finding in several patients, underscoring the importance of recognizing this abnormality. To our knowledge, only 1 previous study investigated the radiologic-pathologic correlation of Erb palsy. In their series, Abbott et al6 demonstrated that PST was histologically found to represent scar tissue in most cases and reparative neuroma in the remaining minority of cases. They reported no difference in signal intensity between these pathologically distinct etiologies of PST; however, the morphology of the abnormal soft tissue was not studied in that series. PST has supplanted the better known finding of pseudomeningocele as the primary diagnostic feature in cases of Erb palsy, reflecting the transition from conventional imaging modalities, such as myelography, to current MR imaging techniques. Several potential avenues of research can further our understanding of this finding. Surgical pathologic correlation may shed light on whether varying histologies relate to differences in MR imaging features of PST. In addition, many of the studies on the imaging findings in brachial plexus injuries focus only on infants with obstetrically induced damage. However, adults can also have brachial plexus trauma, usually as a result of motorcycle crashes. It is unknown whether our findings in patients with Erb palsy translate into demographically different patients with similar clinical injuries. Nonetheless, with methodic image analysis, accurate and confident detection of nerve root injury in patients with Erb palsy can be accomplished when PST is identified. Previously presented in part at: Annual Meeting of the American Society of Neuroradiology, May 31–June 6, 2008; New Orleans, Louisiana. Accepted after revision September 22, 2009.